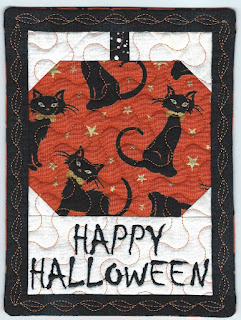 I thought I would show you some of my Halloween and Autumn projects that I am currently working on. 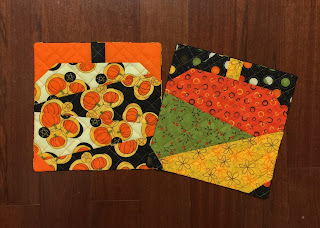 Using some of Chantell's designs I made a few mug rugs and a mini quilt. 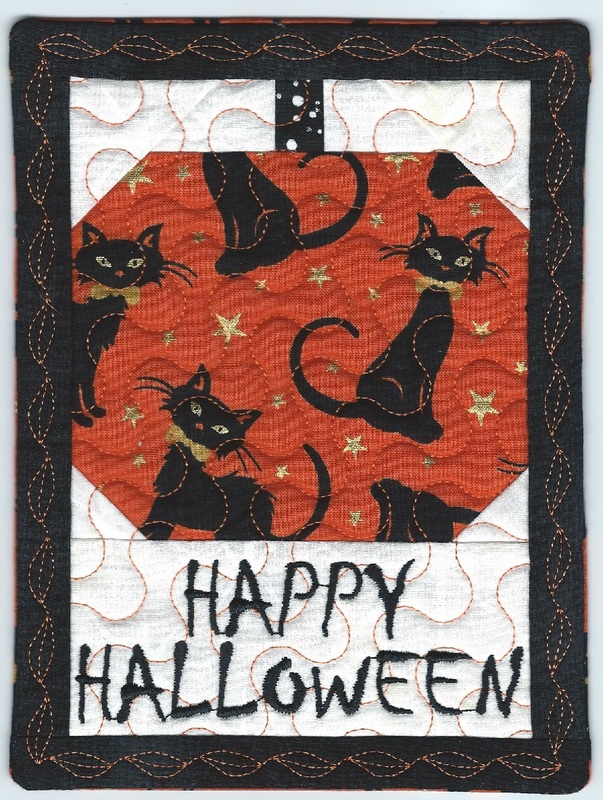 I also thought it would be fun to join in a Halloween Mystery Sew Along at Fort Worth Fabrics. 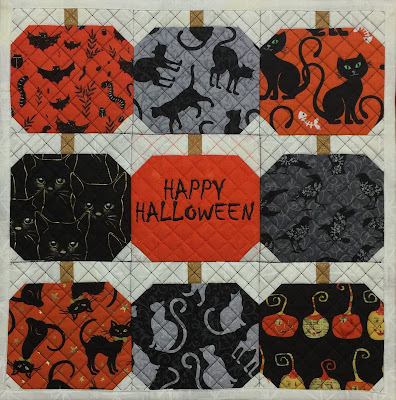 The Halloween sew along is finished, but she is currently offering two others: A Cozy Up Mystery quilt and a Winter Flurry Holiday Mystery Quilt. 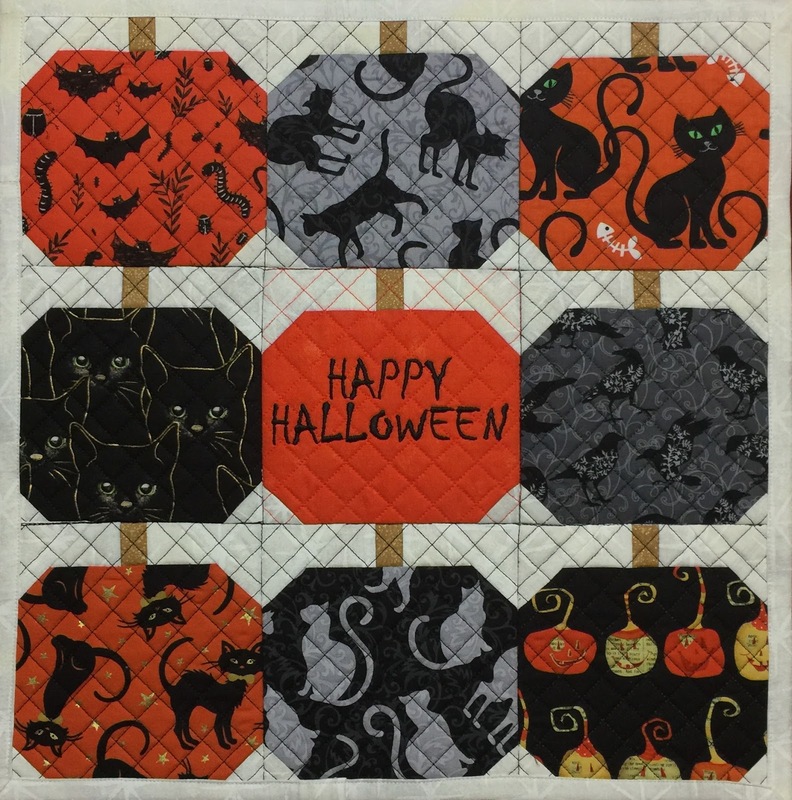 I haven't quilted my Halloween one yet, so it's just a quilt top for now. I also entered a Halloween/Autumn Anita Goodesign contest. The rules were that you had to use their designs to complete a project by Oct 30. Some really nice prizes are being offered. I think they will pick the winners tomorrow. I am keeping my fingers crossed. They are all being posted on a Facebook page of theirs and you can vote for your favorites by liking (my post) LOL! 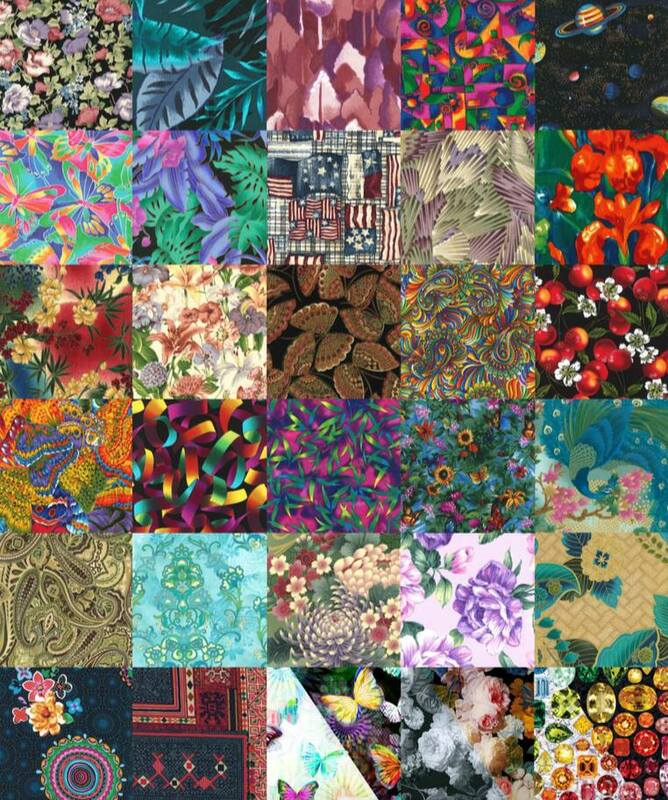 I love entering the Hoffman Fabric Challenge. This year, 2018, is the 30th year they have sponsored the challenge. 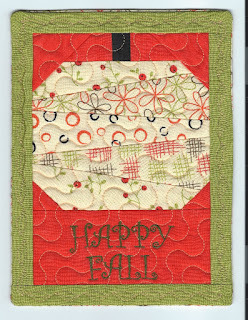 The focus fabric they choose each year is always beautiful and a delight to work with. 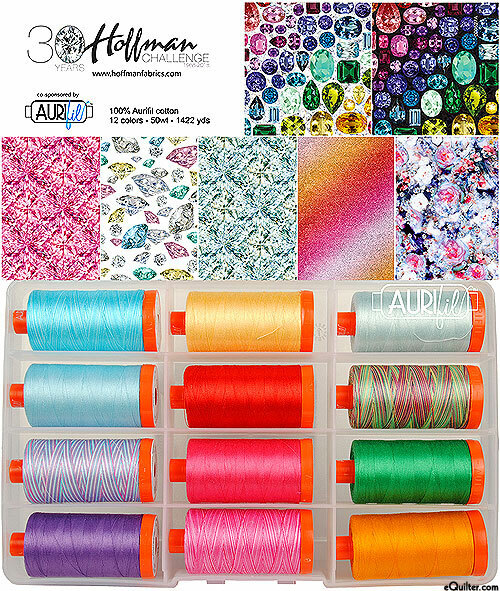 This year's fabric, Shine On!, is one of the most vibrant and colorful ones they have chosen so far. Just like last year, you could choose one or both colorways of the challenge fabric. I decided to use both. 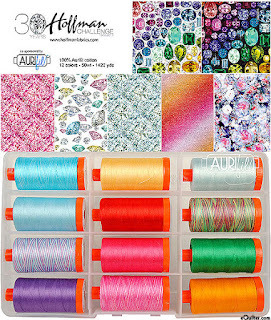 Aurifil threads, who sponsors three of the prizes, also designed a gorgeous 12-spool collection of coordinating 50 wt. threads that match the Shine On! fabrics perfectly. Another really great idea by Hoffman Fabrics this year was to create and print a panel that had a small piece of each of the challenge fabrics from all thirty years. This was perfect for an idea I had for the border of my quilt! I wanted to showcase all thirty years in my quilt without taking away from this years challenge fabric. Here are some pictures of my progress on the quilt itself! As always, I have to thank Chantell and Mia for their hard work and talent. They seem to always be able to digitize exactly what I sketch out for them. 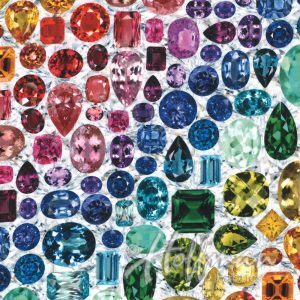 Let's start with some of the 'border' diamonds. Chantell digitized these for me. 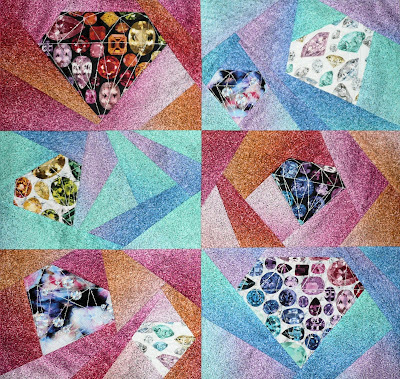 I made them using pieces of the panel so each diamond has a different challenge fabric from a previous year. Next I needed a 'diamond' themed background. Chantell also digitized this panel for me. I used some of the other Shine On! 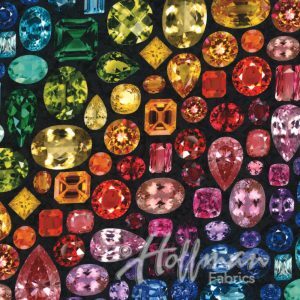 collections fabrics for the background and for some of the diamonds. Mia then digitized 'Lucy' for me. 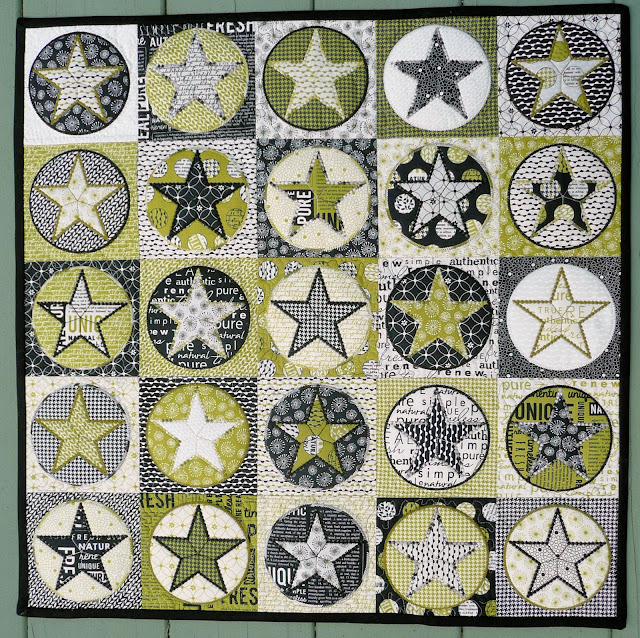 Lucy is appliqued on top of the panel in four separate hoopings. I used my Babylock Destiny embroidery machine's cameras to make sure that all the pieces aligned perfect. I am pretty sure you have figured out the theme I chose by now. 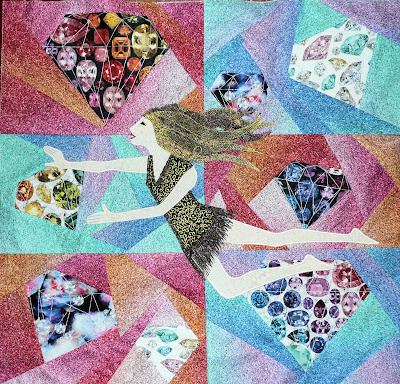 The title of the quilt is 'Lucy in the Sky with 30 Years of Diamonds'. It is hard to see all of the details in this picture, but there is a lot of bling involved. There are a ton of rhinestones glued on it in different shapes and sizes which took several days to get them all on. You also can't see it, but the quilting design is little stars and I quilted it all with several metallic threads from Aurifil. Here it is! And the best news? It WON!!! 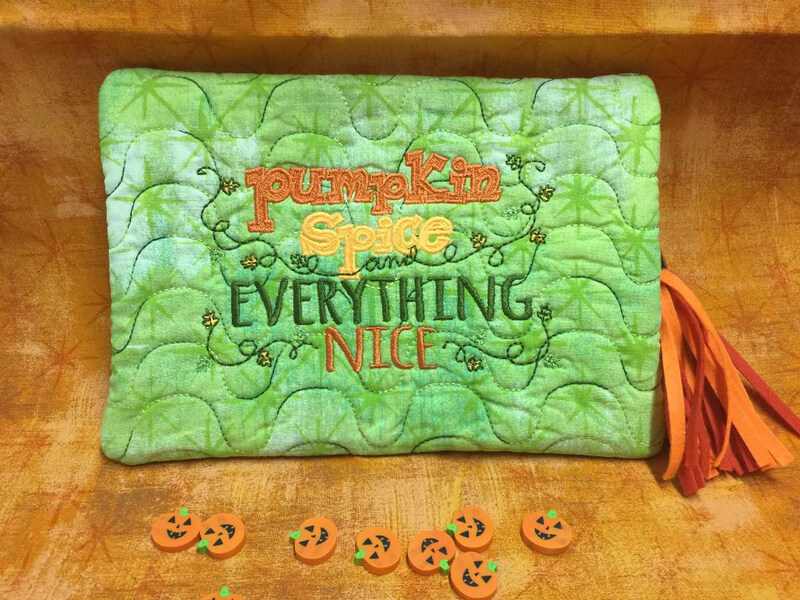 1st Place in the 'Best Use of Aurifil' category!!! The Hoffman Challenge is in its 30th year and what a blast it has been! We have seen thousands of incredible works of art and enjoyed sponsoring the Hoffman Challenge. We thank you for your contribution to making the Challenge successful and fun. As Hoffman strives to lead the industry in change and innovation, we have decided to make this 30th anniversary the final year of The Hoffman Challenge as you know it. We have a collective goal to bring you a new and innovated Hoffman Challenge in the future. Again, thank you for you loyalty and support of The Hoffman Challenge! We hope you enjoy seeing the 2018 Shine On! Projects travel though September 2019, and we look forward to bringing you a new Hoffman Challenge in the future. Makes me think they will not even have a contest next year which would be sad. Hopefully they will continue with some kind of fun contest for us to enter! 2017 in Review - Did I Accomplish Anything? As 2017 is almost over, I am doing what most people do at years end, contemplating just exactly what did I accomplish this year. As this was my first full year after retirement, I was hoping that I would get a good start on all the projects that I had been putting off while working a full time job. My first goal was to enter three quilt contests this year. 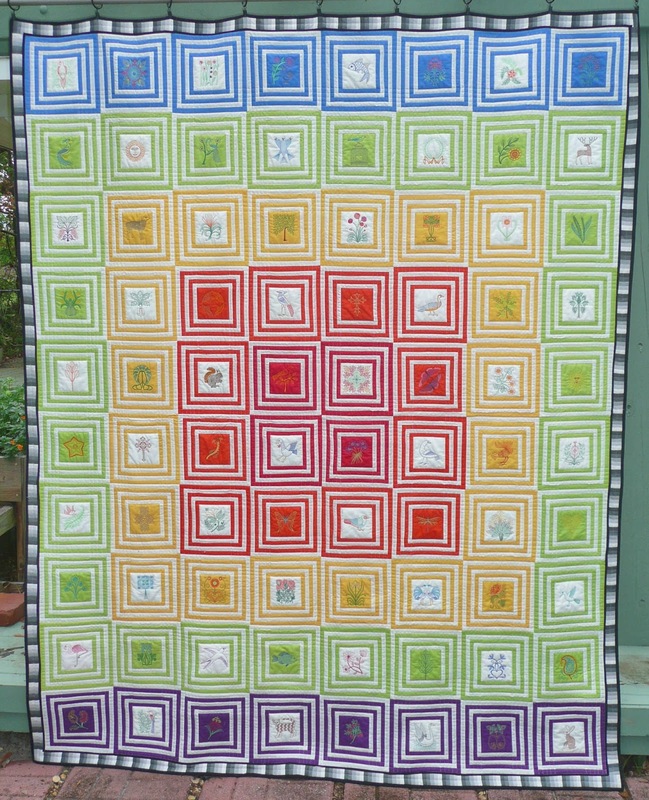 I started out with the Kaffe Fassett 'I Am An Artisan' quilt contest. The fabrics that we had to use were absolutely spectacular. Such a great color palette to work with. The added embroidery designs from Mia and Chantell made the quilt. 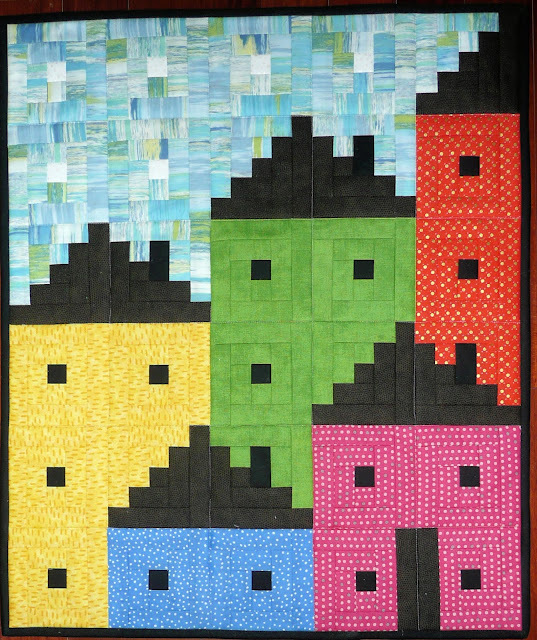 Not only did this quilt win the Viewer's Choice Award, it also was published in the 2017 Quilt Festival Quilt Scene magazine, and it was hanging in the Houston Quilt Show. 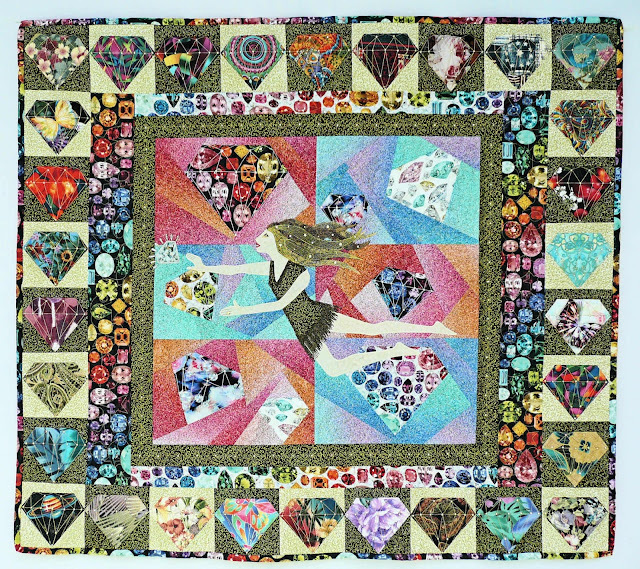 I also just got notice that it will be hanging in the International Quilt Festival in Chicago April 12-14 2018. A couple of the prizes I won have been either mailed or collected. 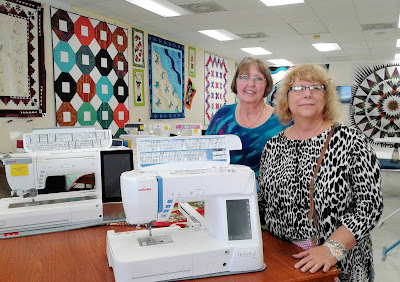 I received my prize fabric in the mail and then I picked up my new sewing/embroidery machine at the local Janome dealer Boutique 4 Quilters. 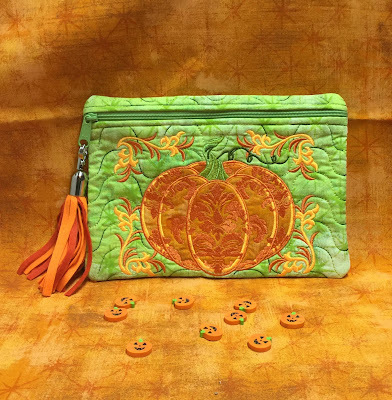 I also took some of the fabric I won and made zipper bags in the embroidery machine for some of my friends. I am calling this success number one for the year! Next up is the Hoffman Challenge that I enter almost every year. 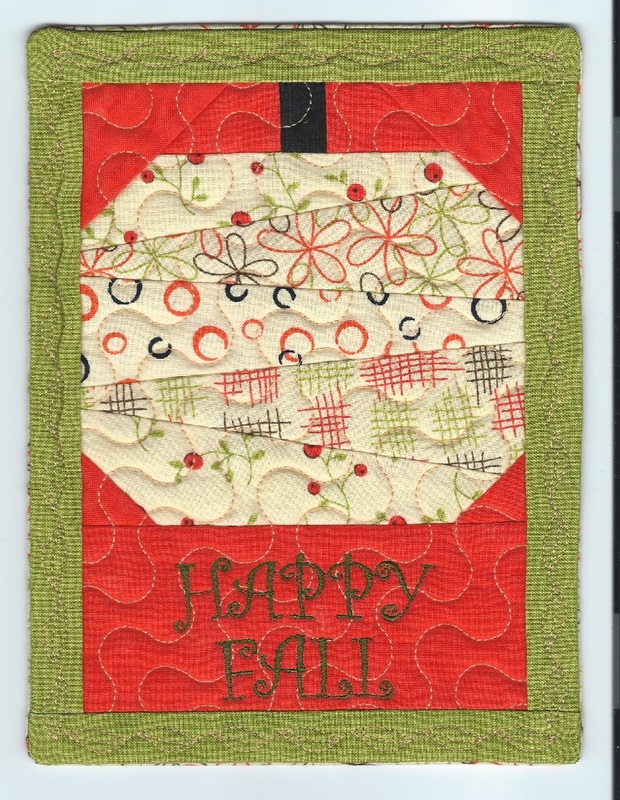 It's a fun contest and the fabrics are usually very interesting and inspiring. 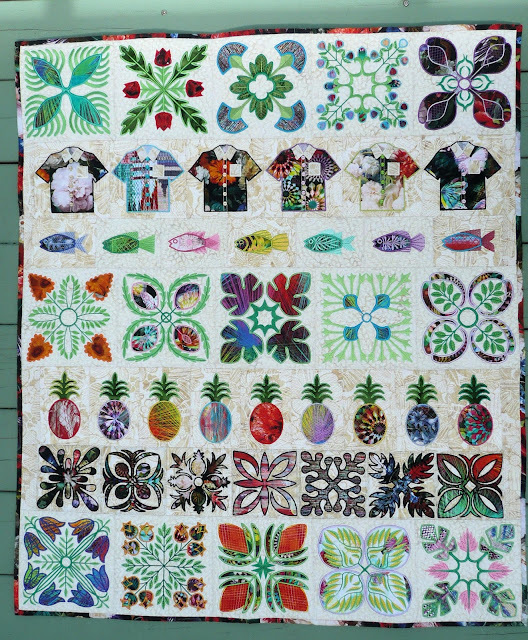 This years was especially fun because it just wanted to be made into a Hawaiian themed quilt. It won the Hoffman Choice award! That was pretty exciting but then I found out that Mr. Hoffman loved it so much that he bought it and it now hangs in his office in Southern California. It didn't get to travel with the other quilts this year, but Mr. Hoffman says that he will display it at a few major shows. I have received both my prize and the ribbon from Hoffman which are very nice. This is accomplishment number two! And yes, I do plan on entering in 2018! Thank you Chantell and Mia for your embroidery designs! Next was the Moda Bella Solids challenge. This was a huge project. 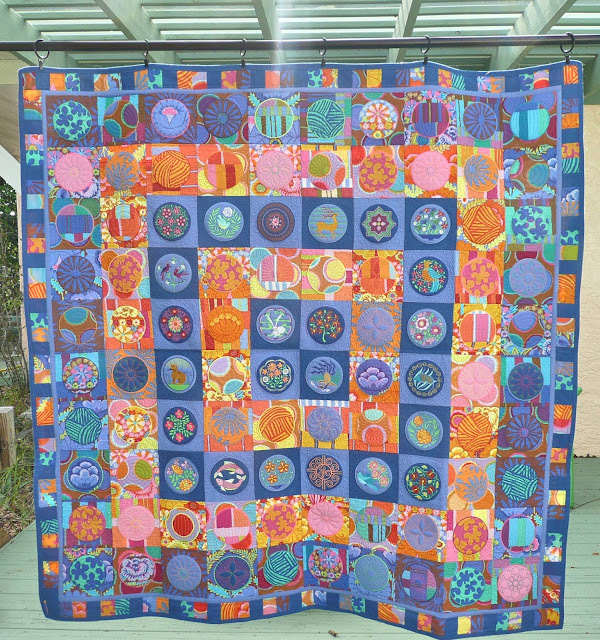 One of the biggest quilts that I have ever completed. Unfortunately it was not picked as a finalist for the Moda Bella contest. 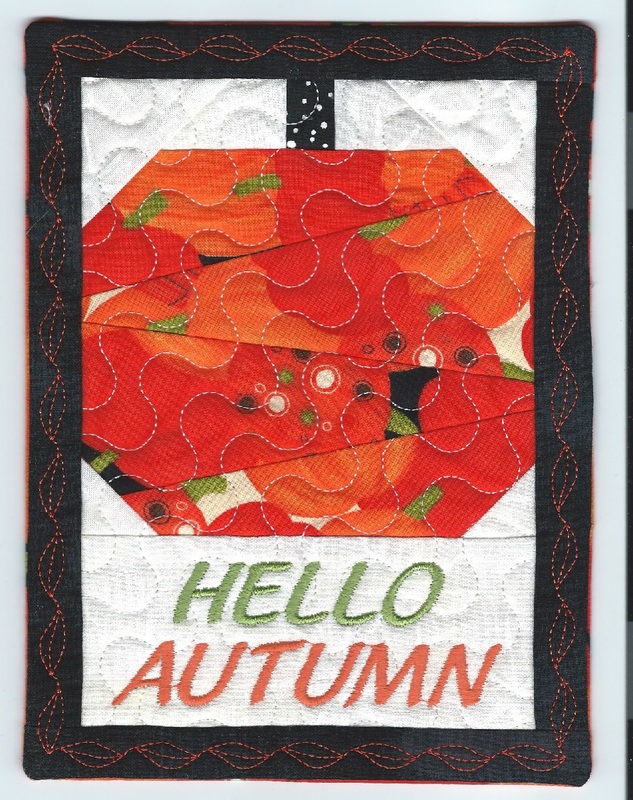 But the great news is that Bella Windows - Peeks of Nature was a better fit for the 2018 World Quilt Florida competition in Orlando January 18-20, and it is a finalist in their competition! I am keeping my fingers crossed that it will be my first win in 2018!! 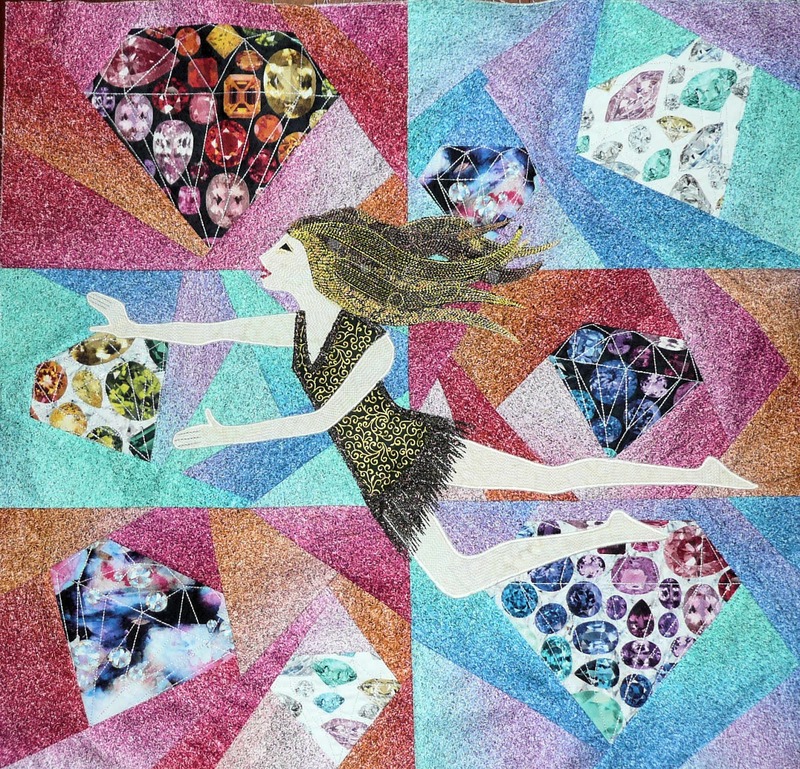 I still can't believe that Mia drew and digitized 80 different designs for this quilt. 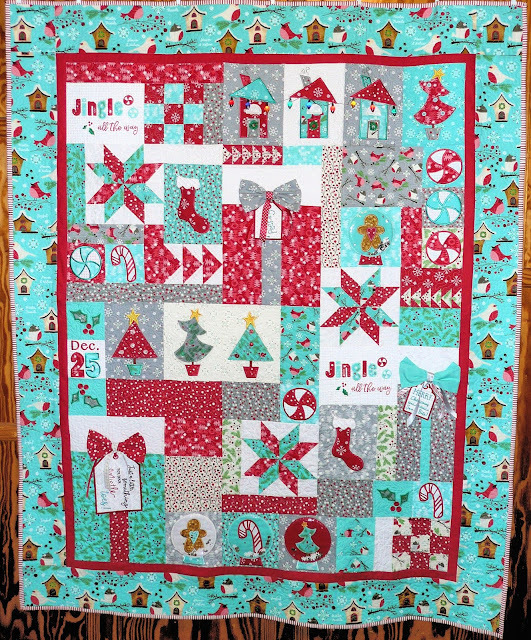 And the quilt of course couldn't have been made without Chantell's modified log cabin block! Since all three quilts were completed as planned and each one of them has had great success, I am calling my first goal of 2017 complete. My next goal was to find something 'to do' that would earn a little cash and also share my talent as an embroidery artist. 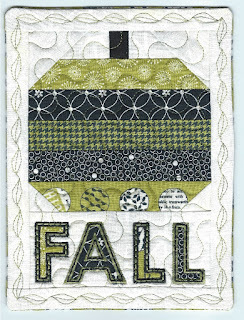 I feel that I have accomplished that goal by teaching many classes at Quilts and Lace. I seem to have become the Kimberbell expert. I have taught many different projects that have required different levels of embroidery skills from beginner to advanced. But the biggest project that I taught was the 'Jingle All The Way' quilt. I think it was my favorite Kimberbell project for the year. I seem to have caught the 'competition' bug because I went ahead and entered a couple more contests. 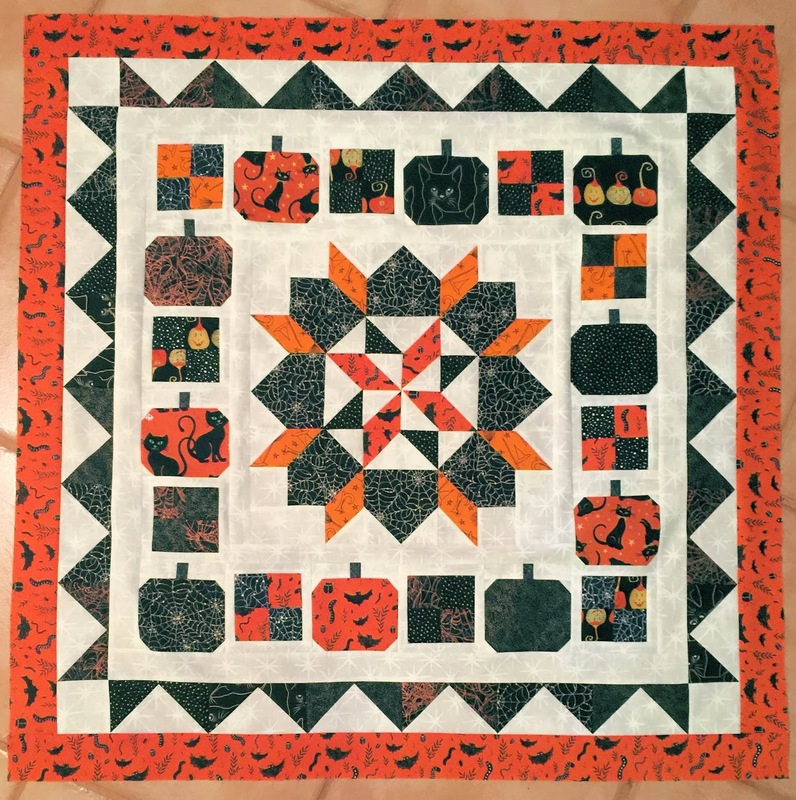 The first one was a Moda mini quilt competition and the requirements were to use some of the Moda Primitive Gatherings fabrics. I had a few different categories to chose from and I of course chose applique. 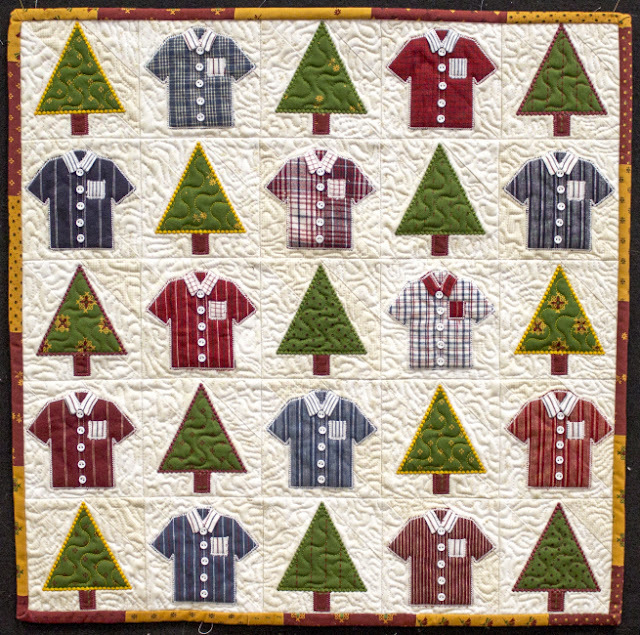 Everyone who entered ended up sending their quilts to Lisa's shop where she displayed them for the holidays. 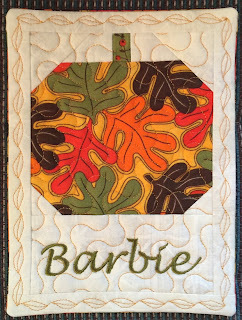 She just announced the winners about a week ago, and I was very excited to learn that my little Lumberjack quilt won the prize for Applique! 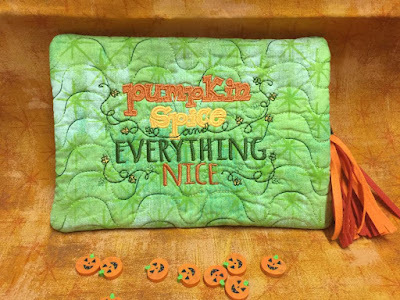 You can see the other winners here on Lisa's blog. She has a wonderful shop and sells beautiful things. 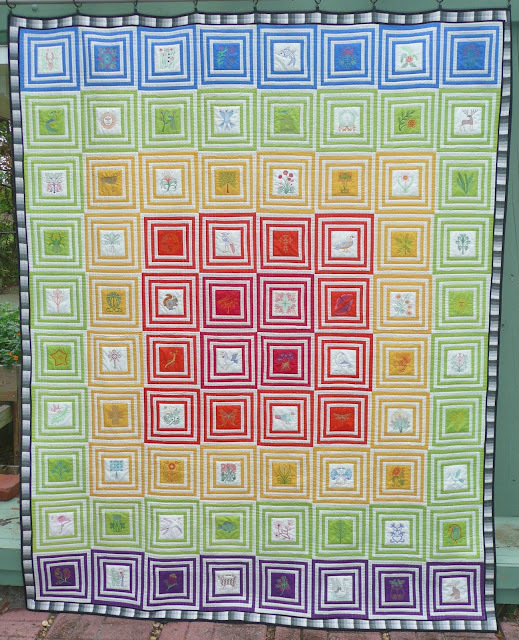 I just received my very nice prize package and my quilt back. Since the quilt was being gifted to Jackie as part of her Christmas present, it arrived just in time. 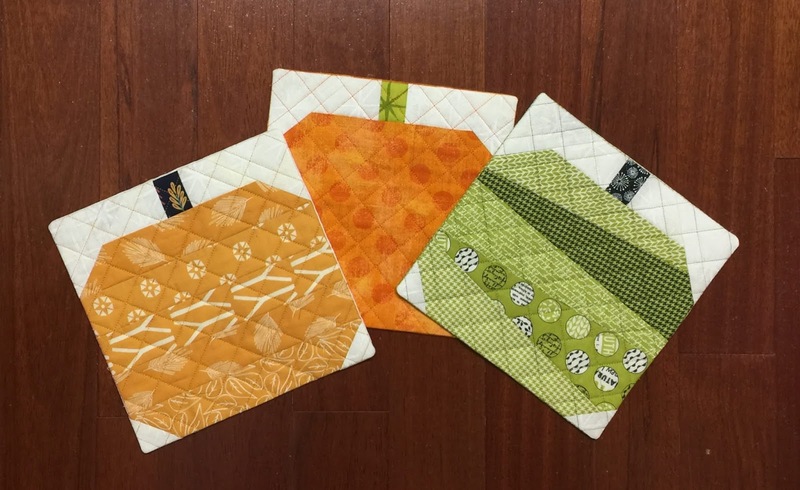 The next little mini quilt contest that I entered required a Moda/Aurifil thread combination. 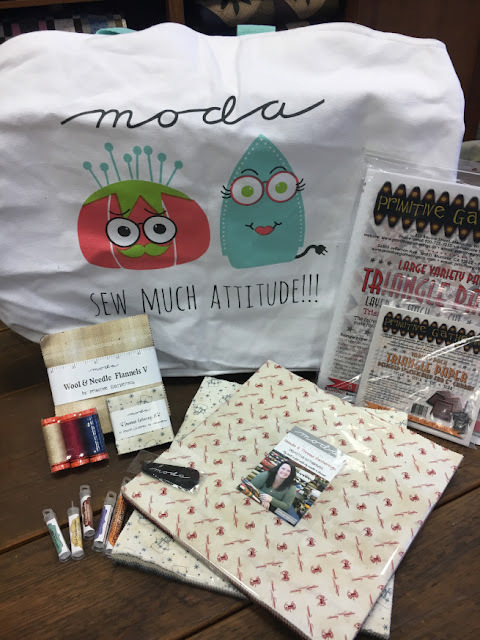 We had to use both a precut Moda fabric package and Aurifil threads. I didn't realize at the time that it would not be a 'real' competition. What I mean is that they just threw in a hat all of the names of everyone who entered and picked the winner out of the hat. So it really didn't have anything to do with talent, just perseverance in finishing your mini quilt. 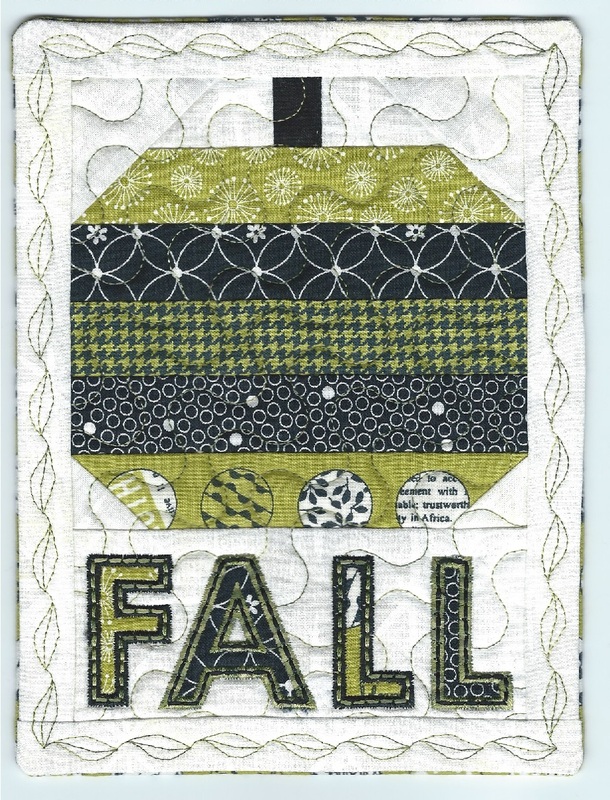 But that was ok because I ended up with a really knock out mini quilt! I love it and its going up on my wall! 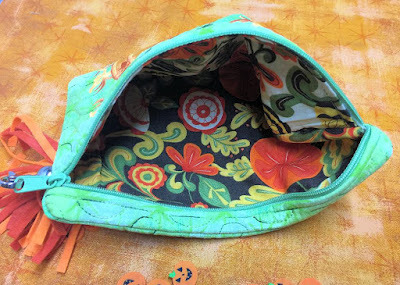 I used Moda Sweetwater Authentic fabric and of course the Aurifil threads. 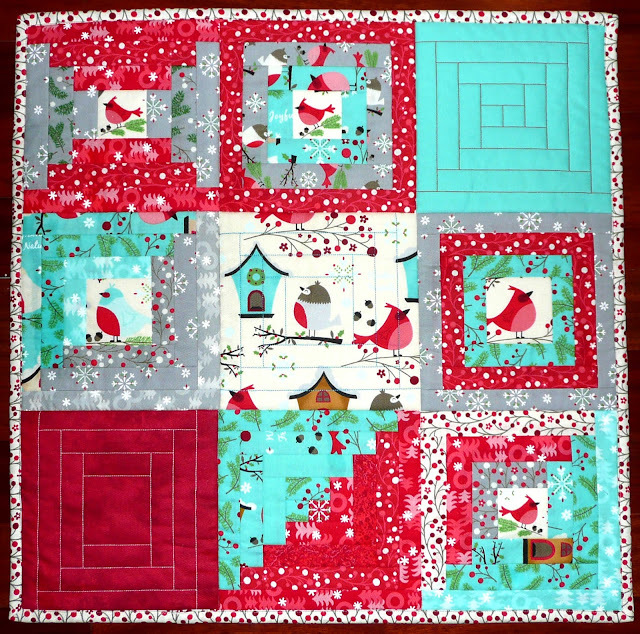 I also completed a few other miscellaneous projects, quilts, and I did a lot of test stitching for Chantell. I even took a few classes myself, after all, there is always something new to learn. I think I am going to call the year a major success! Not only did I complete and surpass all of my quilting goals, but I am now an AWARD winning quilter and I have been PUBLISHED in a magazine! I am thinking that makes for a very successful 2017! I don't know what my goals are for 2018 yet, but I will really have to work very hard if I plan on accomplishing even half this much next year! Bubby kitty even got his own quilt this year.